Our first church meeting at City Hall was so wonderful and we were so pleased to see that there seems to be a new climate of tolerance from City Council toward our Christian faith. We had prayer, teaching from the Word of God, and we sang old hymns. 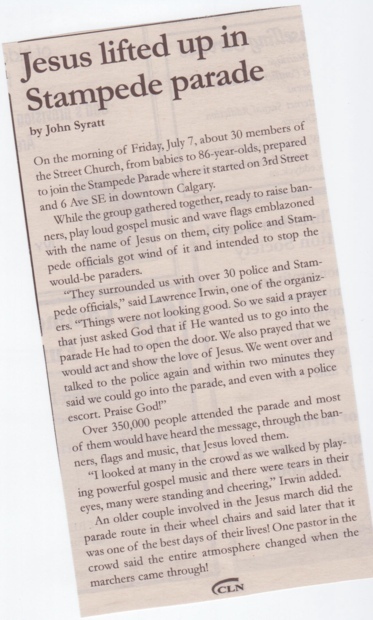 Overall, it was beautiful and such an opportunity to engage Calgary’s citizens with the culture of Christ right at the heart of the city, Calgary’s City Hall. Imagine the Word of God going forward for everyone to enjoy, that’s the country, and its freedoms, that our forefathers fought and died for. It’s still hard to comprehend but our mayor, Naheed Nenshi, has made it clear that City Hall’s Atrium is the citizens’ living room and everyone is welcome, and we wholeheartedly agree. So, this Tuesday, we are so thrilled to invite anyone that is willing to come and worship with us, fellow believers, at the gate of the city, inside City Hall’s Atrium at noon, during lunch, for another hour of praise, worship and celebration in the name of Jesus Christ. There will be once again teaching from the Word of God and everyone is welcome to come and participate. Especially now, as we approach “Christ”mas, we all need to be reminded about what Jesus Christ did for everyone – that He was born, that He died and rose again, and that whoever will repent from their sins, and turn to Him and confess that He is Lord will be saved. Please show up at ten to twelve so that we can start on time. Please remember that the Word of God tells us to not only be hearers of the Word but doers also. Jesus said, “Go out and preach the word to all creation”, so come out and exercise your faith. For more information, call 403-607-4434 or e-mail art@streetchurch.ca. I have a question for you O Calgary! April 10, 2011 Artur Pawlowski Comments Off on I have a question for you O Calgary!